Sherbrooke, Que. 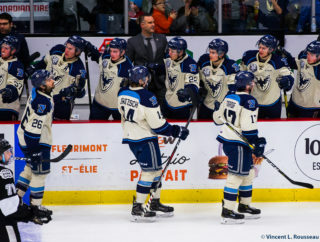 – After dropping Game 1 at home to the Blainville-Boisbriand Armada, the Phoenix were able to string together four straight victories to knock off the 6th seed in front of an electric Sherbrooke crowd on Friday night, and punch their ticket to the second round of the QMJHL Playoffs. The Birds became the first team in the Western Conference to advance in the President’s Cup, marking only their second series victory in the seven-year history of the franchise. Their first came in round 1 of the 2018 Playoffs in seven games against the Rouyn-Noranda Huskies. “I am very proud of the guys. We battled hard all series long,” said Stephane Julien. “We had some highs and lows in our game but overall we are very satisfied. The Armada were very competitive, we need to give them credit for that. They never gave up and they are a team that works really hard. They gave us some trouble but the guys should be very proud for winning this series,” added the coach. Game 1 (March 22 @ SHE): The series got off to a slow start for the Phoenix, who were coming into the playoffs as the 3rd seed in the Western Conference. As heavy favourites to move on, the jitters most definitely got to them early. Former Sherbrooke netminder, Brendan Cregan, stole the show in the opening game, stopping 33 of 34 shots to give the Armada an early 1-0 advantage in the best-of-7. The Birds found themselves down 3-0, before Samuel Poulin got them on the board late in the second period. Despite outshooting the opposition 14-6 in the final frame, it was the visitors that tallied two more goals to walk away with a 5-1 win. For the box score and highlights click here. Game 2 (March 23 @ SHE): Sherbrooke responded in a big way in Game 2 and followed the lead of their captain, Samuel Poulin, who scored a hat trick en route to a dominant 6-0 victory to even the series at 1-1. The Phoenix peppered Cregan with 44 shots, half of which came in the middle stanza, where they scored four unanswered goals. Samuel Poulin (3), Alexandre Joncas and Bobby Dow were the goal scorers in this one. Dakota Lund-Cornish made 17 saves for the shutout. “I think we competed more. Our preparation was better, we were more focused on the small details and it paid off in the end,” said Poulin when asked about the difference between Game 1 and 2. “We got the result we wanted today. For me, the hat trick doesn’t mean much, I am just happy we got the win,” added the captain. 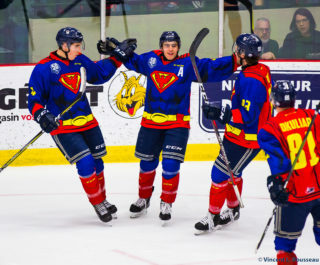 Game 3 (March 26 @ BLB): After dropping a game at home, the Phoenix knew they needed to pick up a precious two points on the road in Blainville to regain home ice advantage. With Game 3 tied going into the final 20 minutes, Stephane Julien’s group took their game to another level, exploding for five third period goals to prevail and capture their first lead of the series. The first line of Poulin-Robert-Voyer combined for nine points in the winning effort. Game 4 (March 27 @ BLB): Similar to Game 2 in Sherbrooke, the Phoenix came flying out of the gates, scoring the first four goals of the contest. The playoffs especially, are a time for the veterans of a team to step up and show their worth. That is exactly what the Phoenix were hoping for in this one and that is what they got. Ryan Da Silva, Felix Robert, Alex-Olivier Voyer and Benjamin Tardif each found the back of the net for the blue and beige, before the game was even 30 minutes old, to give their team a four-goal cushion. The Phoenix and the Armada traded two goals apiece the rest of the way as Sherbrooke grabbed a firm 3-1 grip on the series before heading home for Game 5. “I liked the way we started the game. We thought of it like a Game 7. We wanted to play our best game of the series today and again in the first 10 minutes we put a lot of pressure on their goalie. We were opportunistic taking a 2-0 lead and from there we did a good job at controlling the play,” expressed Julien. For box score and highlights click here. 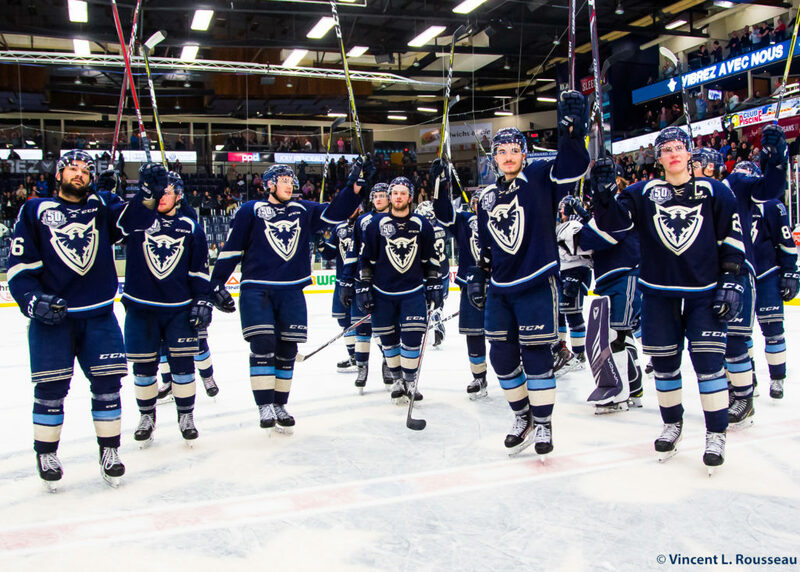 Game 5 (March 29 @ BLB): The playoff vibe was in the air in Sherbrooke ahead of Game 5, as 3190 showed up at the Palais des Sports to cheer on the Phoenix in hopes of seeing them put a close to round 1. The Birds did not disappoint, using the lively crowd to their advantage to eliminate the Armada 4-1 in a tightly played contest. After giving up a goal in opening minute, Dakota Lund-Cornish was stellar in net for Sherbrooke, making a series of timely saves to backstop his team to the win. The Phoenix used an unlikely source of scoring for the game winning goal, as Michael Kemp went end-to-end and snapped a, what looked to be a harmless shot, passed Cregan to give the home team the third period lead. That was a lead they would never relinquish. Benjamin Tardif netted the series clinching goal shortly thereafter with a perfectly placed shot over Cregan’s left shoulder, much to the delight of the home crowd. Bobby Dow added an empty netter in the fianl seconds, before the team poured onto the ice in celebration. A day after the series concluded, the organization announced that back-up goalie, Thommy Monette, would be suspended indefinitely from the team. William Desmarais, of the Midget AAA Interpride de Gatineau, has been called up to replace Monette and will finish the season with the Phoenix. 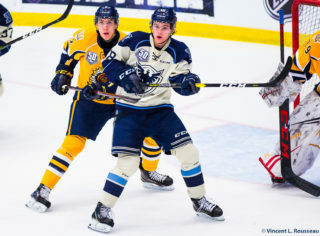 If Shawinigan beats Rouyn-Noranda, Sherbrooke will play the winner of Val d’OR/Victoriaville, starting Friday, April, 5th, 2019 in Sherbrooke.